Health and Science Twitter & Blog Top 50 and 100 Lists. How to Separate the Wheat from the Chaff. Most people just tweeted “Top 100 Scientists on Twitter”, others were excited to be on the list, a few mentioned the lack of scientist X or discipline Y in the top 100. It is surprising how easy it (still) is for such spammy Top 50 or 100 Lists to get viral, whereas they only have been published to generate more traffic to the website and/or to earn revenue through click-throughs. It makes me wonder why well-educated people like scientists and doctors swallow the bait. Don’t they recognize the spam? Do they feel flattered to be on the list, or do they take offence when they (or another person who “deserves” it) aren’t chosen? Or perhaps they just find the list useful and want to share it, without taking a close look? Beware if there is no (or little info in the) ABOUT-section. Beware if the site mainly (only) has these kind of lists or short -very general-blogposts (like 10 ways to….) except when the author is somebody like Darren Rowse aka @ProBlogger . Reputable sites less likely produce nonsense lists. See for instance this “Women in science blogging”-list published in the Guardian . When the site itself seems ok, check whether the names on the list seem trustworthy and worth a follow. Clearly, lists with fake accounts (other then lists with “top 50 fake accounts” ;)) aren’t worth the bother: apparently the creator didn’t make the effort to verify the accounts and/or hasn’t the capacity to understand the tweets/topic. Ideally the list should have added value. Meaning that it should be more than a summary of names and copy pasting of the bio or “about” section. For instance I have recently been put on a list of onlinecollegesusa.org [b], but the author had just copied the subtitle of my blog: …. a medical librarian and her blog explores the web 2.0 world as it relates to library science and beyond. However, sometimes, the added value may just be that the author is a highly recognized expert or opinion leader. For instance this Top Health & Medical Bloggers (& Their Twitter Names) List  by the well known health blogger Dean Giustini. Your Blog is being featured! If you have any feedback please let me know, or if you think your audience would find any of this information useful, please feel free to share the link. We always appreciate a Facebook Like, a Google +1, a Stumble Upon or even a regular old link back, as we’re trying to increase our readership. While some of the list may be worthwhile in itself, it is best NOT TO LINK TO DOUBTFUL LISTS, thus not mention them on Twitter, not retweet the lists and not blog about it. For this is what they only want to achieve. But what if you really find this list interesting? Find posts/lists produced by experts in the field and/or people you trust or like to follow. Their choice of blogs or twitter-accounts (albeit subjective and incomplete) will probably suit you the best. For isn’t this what it is all about? Especially useful are posts that give you more information about the people on the list. Like this top-10 librarian list by Phil Bradley  and the excellent “100+ women healthcare academics” compiled by @amcunningham and @trishgreenhalgh . Strikingly the reason to create the latter list was that a spammy list not recognized as such (“50 Medical School Professors You Should Be Following On Twitter” [c]) seemed short on women…. Check existing Twitter lists of people you find interesting to follow. You can follow the entire lists or just those people you find most interesting. Examples: I created a list with people from the EBM-cochrane people & sceptics . Nutritional science grad student @Nutsci has a nutrition-health-science list . The more followers, the more popular the list. Check interesting conversation partners of people you follow. Check accounts of people who are often retweeted in the field. Worth mentioning are shared lists that are open for edit (so there are many contributors besides the curator). Lists  and  are examples of crowd sourced lists. Other examples are truly open-to-edit lists using public spreadsheets, like the Top Twitter Doctors, created by Dr Ves and lists for science and bio(medical) journals , created by me. Finally, if you find the spam top 100 list truly helpful, and don’t know too many people in the field, just check out some of the names without linking to the list or spreading the word. Beware of Top 50 “Great Tools to Double Check your Doctor” or whatever Lists. In short this post describes that (some) Top 100 etc lists may not be as useful or innocent as they seem. Some of these lists are created by real scam-sites, who’s only goal is to make money via click-troughs and to get as much traffic as possible, via YOU (and me)! The scam appears in many guises. As submissions for a blog carnival, i.e. 100-weight-loss-tips-tricks. 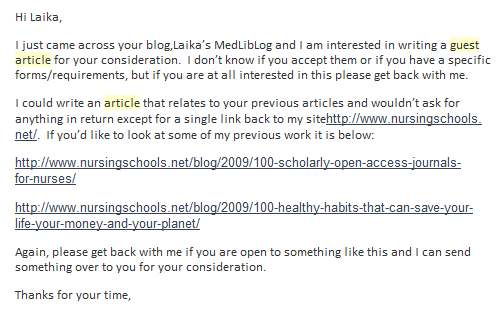 An offer of a health care student who asks you to do a guest post (you only have to link back to his/her site). In the form of a mail, dropping you a quick line that you’re included in a top 100 list, possibly worth mentioning to your audience. You just noticed a top 100 list with excellent sites, worth mentioning on Twitter or Friendfeed, so your followers become aware of the sites and pass the message. The first two are pretty obvious scam. The latter two are more difficult to see through. Why do I write another post? Because it happened again, today. And I think I should bring the message home more clearly. Below you see what happens. Berci has found a list with 50 great tools to “Double check your Doctor”. He tweets the link to what he considers a great resource list, and in no time the message and the link are tweeted several times. Some people also post a link on their blog. Finally this will result in more traffic to the website onlinenursingclasses and a higher rank in Google. 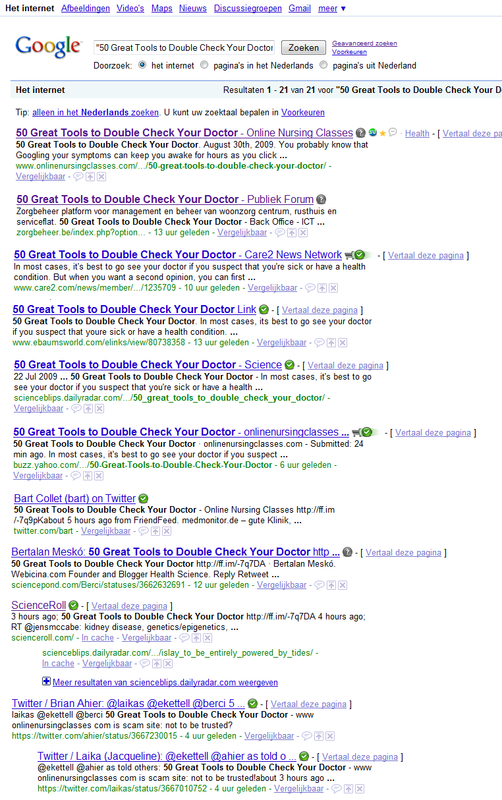 Indeed 12 hours after Berci’s tweet, searching for “50 Great Tools to Double Check Your Doctor” (between quotes) gives just 21 hits (similar hits not shown), many of which can be traced back to the twitter posts. All but one are positive: the last hit is my warning, which was only received by ahier and TheSofa. Ahier deleted his original positive tweet from Twitter. Also worrying is that the spam site was bookmarked by various Stumble upon visitors. And that the one person that made the Stumble upon review also “liked” similar sites, like Online Classes and Learn Gasms. So probably a whole team takes care that the site is socially bookmarked. When several people “like” a site others may be attracted to the site as well. That is the principle of social bookmarking sites. And you and I do the rest…. Why is this bad? You can read more in my previous post or in the post “Affiliate sites” at Ellie ❤ Libraries. 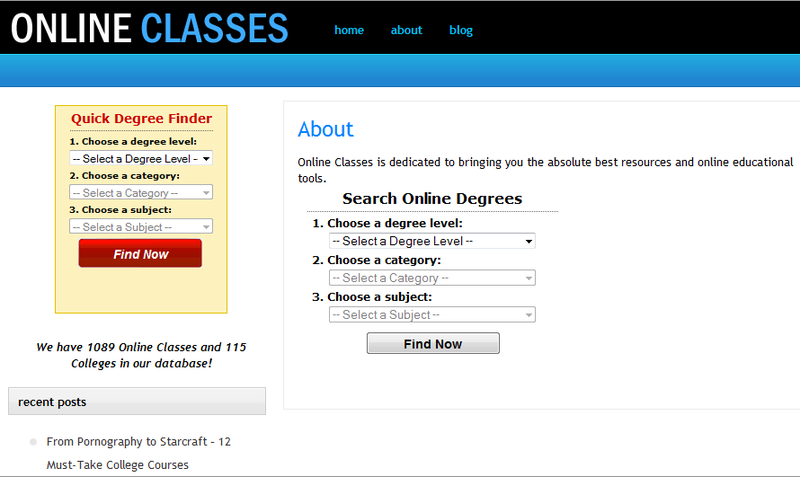 Top 100 Librarian Friendfeeds to follow at cheapie online degrees com at Tame the Web.com. I sometimes see other libloggers linking to sites like these and I have a word of advice: don’t. When we link to low-content sites from our high-content sites, we are telling Google and everyone that we think that the site we are linking to is in some way authoritative, even if we’re saying they’re dirty scammers. We’re helping their page rank and we’re slowly, infinitesimally almost, decreasing the value of Google and polluting the Internet pool in which we frequently swim. Don’t link to spammers. How do you know that you can’t trust that particular site? The home page often contains prominent links (clicks) to Kaplan University, University of Phoenix, Grand Canyon University, and/or others. People behind the site often approach you actively (below are some examples) to gain your interest. It is unclear how the lists are made and who is behind it. There is no real information, only lists and degree finders. So spread the word! Be careful with those list. DON’T LINK TO THEM! And if you see a possible interesting list, first CHECK the site: WHO, WHY, WHAT, WHERE AND WHEN. Once you’ve seen one, you’ve seen them all! An example of a letter asking to write a guest post. Vanity is the Quicksand of Reasoning: Beware of Top 100 and 50 lists! During the weekend I added some links to sites referring to this blog in the sidebar. There was the 3rd place in the Medgadget competition for the Best New Medical Weblog in 2008, a nice critique by Danielle Worster (the Health Informaticist) in the “Library + Information Gazette”, the inclusion in the Dutch Twitterguide and a place in the Top 50 Health 2.0 Blogs list of RNCentral (”the place to learn about nursing online”) in 2008. We just posted an article, “100 Useful Websites for Medical Librarians” (http://http://www.nursingschools.net/blog/2009/100-useful-websites-for-medical-librarians/). I thought I’d drop a quick line and let you know in case you thought it was something you’re audience would be interested in reading. Thanks! 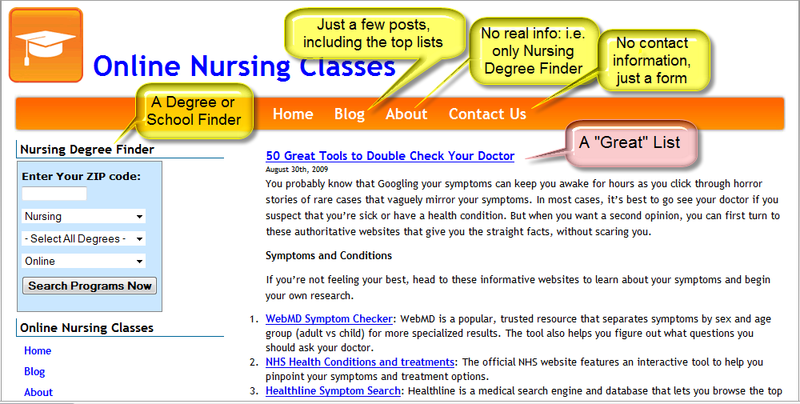 Both the RNCentral and the nursingschools.net lists are subjective ranking list of useful sites on nurses-oriented webpages. And although subjective, they contain numerous excellent and trustworthy sites. I was honored and pleased that I was included in those lists together with the Krafty Librarian, David Rothman, the MLA, the NIH, and NLM. 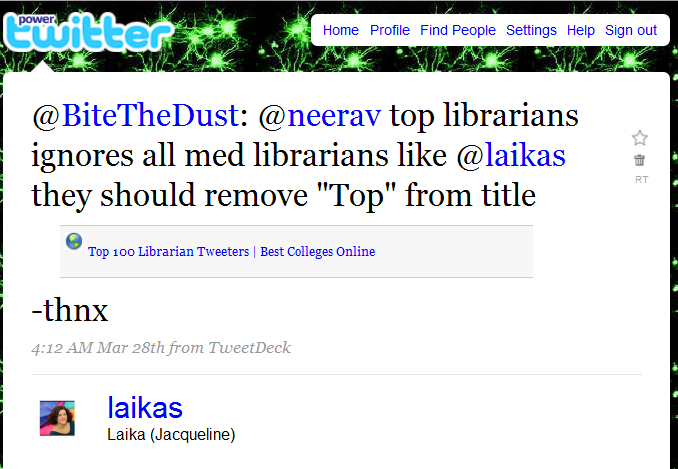 BestCollegesonline.com has posted a list of the Top 100 Librarian Tweeters and I’m honoured to say I appear on the list. In fact, there are five Australian Librarians who made it on the list. The other four were heyjudeonline, neerav, bookjewel, gonty. Unfortunately, they didn’t include Kathryn Greenhill, an amazing librarian who is currently in the US and putting out some very helpful tweets from conferences she is attending while there. She is sirexkathryn on Twitter. Other great Teacher-Librarians to follow include ….. Check out the list and see who else is there you might like to follow. I know that my professional learning has benefited from the generous nature of Librarians who are active on Twitter. This shows that people are pretty serious about those lists and sensitive to who is included or not. There were some mild protests from a few people on Twitter, i.e. from Shamsha here (RT means you repost a tweet, so @shamsha retweets my retweet of @philbradley‘s tweet of the bestcollegesonline list) and from @BiteTheDust (here) regarding @laikas’ omission from the list. However, I’m sure there were many others studying the top 25, 50 or 100 lists with a frown. But wouldn’t any list look different? Apparently it concerns the same bestcollegesonline.com-list as referred to by Lucacept. The colleague who alerted me to this noted that all of the blogs listed were published by librarians in the US and wondered whether we should be doing our own list of top UK librarian blogs. Further, she wondered, if we did, who would we be putting at the top and why? Who (are on the list)? and Why? Those are good questions! This reminded me of a recent remark of @aarontay on Twitter, He sighed something like. “Now I’ve seen 3 of those list. Who makes those lists anyway?” That is a 3rd relevant question. Both this site (http://associatedegree.org) and Learn-gasm – who has the top 100 blogs post going around currently (www. bachelorsdegreeonline. com) are sites designed solely to earn revenue through click-throughs. The “bachelorsdegreeonline” at the end is a tracking mechanism to allow collegedegrees.com to reward sites that send them visitors. While all the schools linked to are legitimate schools, both are misleading sites since they only link to schools that offer an affiliate kickback. They also only link to forms to enter your contact information at third party sites, not to the actual school websites. While the content of the top 100 blogs and 25 predictions lists is completely non-objectionable, the fact that librarians are taking these sites seriously is. What the author is doing is trying to increase his traffic and SEO. He likely does some minimal investigation to determine what sites would have the biggest impact – so in that sense, the lists are probably somewhat representational of influential sites – like I said, the content isn’t the objectional part. He creates the page with the links to the 100 top whatever, then emails all of them to let them know they’re on the list. Every one of them that posts that they’ve made a top 100 list and links back to him increases his site’s page ranking. The more important your site is, the more it helps him, both in search engine algorithm terms (being linked to by someplace important counts for more than being linked to from less popular sites) and because it brings him more incoming traffic. Which also increases his site’s page ranking (and the chance of someone clicking through in a way that gets him paid). …But, this particular little batch of sites that is currently targeting higher education – they are ones that are ostensibly trying to help people find colleges, choose degrees, etc., when in fact they are only linking to forms to enter your contact information for a small subset of online only colleges that offer affiliate linking programs. …on the surface they seem related to education, some have .org addresses, but when we start looking at them critically they fail every test easily – no about page (or at least nothing informative on it), unauthored posts, little to no original content. One of the main components of being a librarian is teaching people to think critically about information, so when we fail to do so ourselves I find it incredibly frustrating. O.k. that hit the mark. A good look at the sites that linked to my blog showed they were essentially the same as those mentioned by @aarontay and Ellie. With links to the same schools. Vanity or naivety, I don’t know. I didn’t pay much attention, but I still (wanted to) quot(ed) them and didn’t doubt their intentions. Nor did I question Clinical Reader’s intentions at first (see previous post). In some respect I really dislike to be so suspicious. But apparently you have to. So, I hope you learned from this as well. Please be careful. Don’t link to such sites and/or remove the links from your blog.